The Committee for Civilian Aspects of Crisis Management (CivCom) is on a four days field trip to the European Advisory Mission to Ukraine. 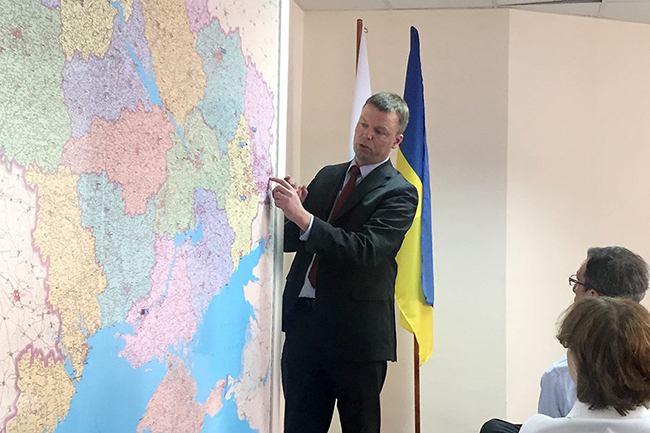 Wednesday May 20 the delegation met in a separate briefing with Alexander Hug, the Deputy Chief Monitor of the OSCE Special Monitoring Mission to Ukraine. Alexander Hug, who arrived straight from a meeting of the ‪Minsk‬ trilateral talks, gave an introduction to the SMMU. The SMMU is a politically neutral, unarmed and civilian mission that monitors the ceasefire in the occupied territories in the East as part of the Minsk Package I and II. The EUAM enjoys positive collaboration with the SMMU, and the EU is engaged in both material and political support for the mission. While the EUAM mandate focuses on the security sector in Ukraine, the SMMU is fast paced and mainly concentrated on monitoring in the occupied territories and on coordinating with implementing partners on the humanitarian situation in the country. After the visit to the SMMU The CivCom delegation departed for Kharkiv and Lviv where they are going to meet with the regional police, regional councils, governors and civil society organizations.